The Porcupine Puffer, Diodon holocanthus, sometimes called the Porcupinefish is named for the spiny appendages covering almost the entirety of it’s body. 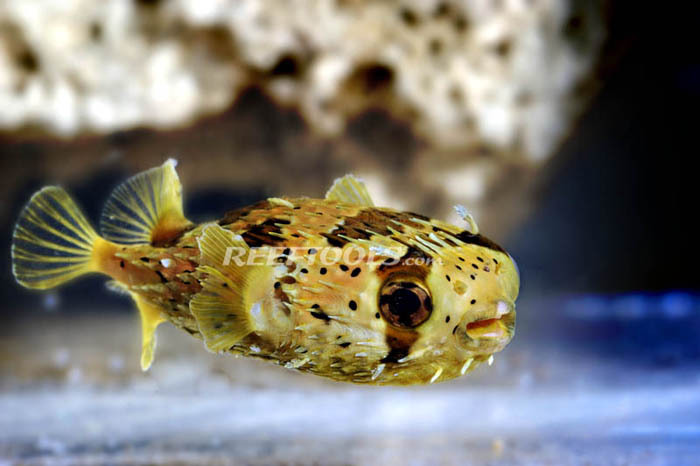 The Porcupine Puffers body is “camouflaged” with a variety of gray and tan spots. As a primary defense system, the Porcupine Puffer is able to inflate it’s body to almost double it’s vertical height by swallowing water or air. The sharp spines are used as a secondary defense mechanism when this fish feels threatened. Some species are poisonous, with a tetrodotoxin being present in some of their internal organs. This neurotoxin, believed to be produced by several types of bacteria obtained in this puffer’s diet, is at least 1200 times more potent than cyanide. An well-skimmed FISH-ONLY aquarium of 180 gallons or more is ideal. It is important to note that this fish may be aggressive at times, and may nip at other tank mates. 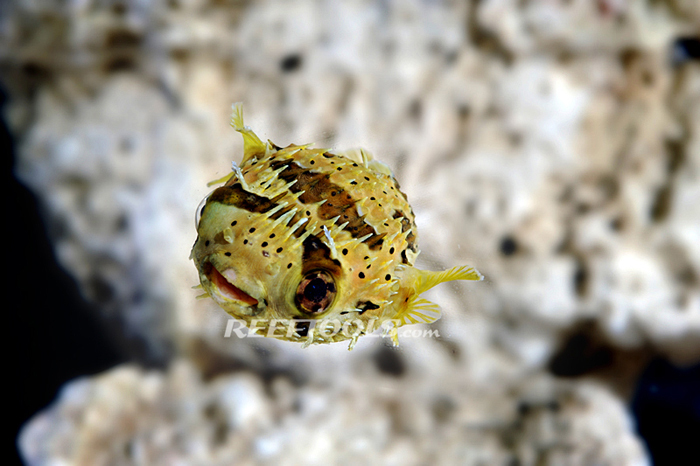 This puffer will eat invertebrates often found in reef tanks, so again, a fish-only tank is the best choice. The Porcupine Puffer should be offered a varied diet consisting of meaty foods (clams, squid, krill, clams, etc). Hard-shelled shrimp will help file back this puffer’s ever-growing teeth.